Mia Irizarry took this video of a man she says harassed her for wearing a shirt with the Puerto Rican flag, saying it was un-American. 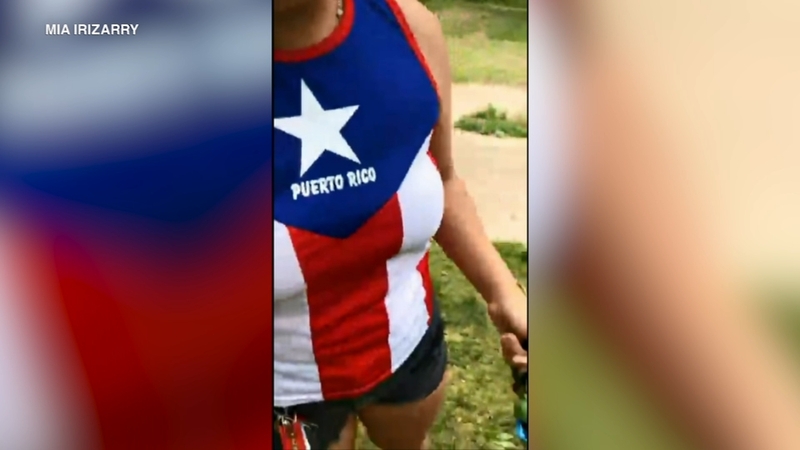 COOK COUNTY, Ill. (WLS) -- The Cook County Forest Preserves officer who was under investigation after he was caught on video standing by as a man harassed a woman for wearing a shirt with the Puerto Rican flag has resigned, officials said Wednesday. Forest preserve officials said Officer Patrick Connor resigned late Wednesday. A spokesman said the investigation into the incident continues and aspects of it will be further addressed, but offered no further information or details. Connor was seen on cell phone video taken by Mia Irizarry, who was in the Forest Preserves of Cook County to celebrate her 27th birthday. She posted the video to Facebook. In the video Irizarry is approached by a man, identified by authorities as 62-year-old Timothy Trybus, who tells her she should not be wearing the Puerto Rican flag shirt in the U.S., and asks "Are you a citizen? Are you a United States citizen?" Irizarry is heard telling Trybus that Puerto Rico is part of the United States as he approaches her multiple times. Irizarry can be heard asking the park police officer, now identified as Connor, for help, and telling him she is uncomfortable. Connor is seen walking away. As Trybus continues to harass her other officers arrived and a female police officer finally steps in on behalf of Irizarry. Trybus is charged with assault and police said those charges could be updated and could include a hate crime.